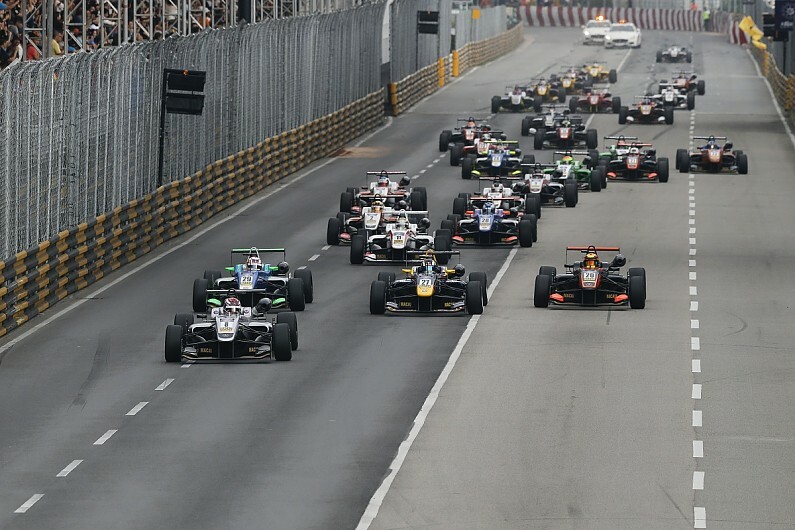 Antonio Felix da Costa took victory from Callum Ilott in the qualification race for the Macau Grand Prix as he bids for his second win in the Formula 3 event. BMW factory driver da Costa, returning to the Carlin Dallara-Volkswagen team with which he won Macau in 2012, slipstreamed past race leader Ilott at the end of a safety-car period, and was able to hold the Briton at bay. Ilott trimmed the gap to the Portuguese, setting fastest lap in his Van Amersfoort Racing Dallara-Mercedes on the penultimate tour and then chiselling the margin slightly more on the final lap to finish just 0.850 seconds behind. Da Costa, meanwhile, almost lost control at Lisboa late in the race when he tried to carry more speed through the corner. "I had not done a single practice start before today, but luckily it was OK," said da Costa. "My car was good, and it gave me the confidence to push straight away. "Callum did a good restart - he did what he needed to do but I was just close enough. It's very hard out there - I'm used to power-steering now so I was struggling with my arms a bit!" Ilott got a poor start from the front row and was fourth exiting the Reservoir kink, but by the time they arrived at the Mandarin Oriental kink he had slipstreamed into the lead past da Costa, Sergio Sette Camara and poleman George Russell, who had led into Reservoir. But behind them, one by one Maximilian Gunther, Anthoine Hubert and Lando Norris slid wide at Mandarin and thumped the barriers, while at the rear Ye Hong Li was launched over team-mate Daiki Sasaki, his wheel hitting Sasaki's head in a scary crash. Remarkably, Sasaki continued and finished the race after pitting for a new rear wing. Ye's shunt brought out the safety car, and when it returned to the pits there were six laps of racing remaining. While da Costa and Ilott drew away, Carlin-run Red Bull Junior Sette Camara fended off Russell, Kenta Yamashita and Felix Rosenqvist. At the restart, Yamashita tried a move on Russell that drew him alongside at the Mandarin kink, and the Japanese T-Sport driver saved the resulting slide with phenomenal reflexes. Yamashita then assertively defended a challenge from Rosenqvist at San Francisco Bend to keep fifth place. Russell appeared to lack pace, and the Hitech GP ace lost fourth place to Yamashita on the penultimate lap at Mandarin, just holding off the Prema Powerteam car of Rosenqvist for fifth and top Macau rookie status. Prema's Nick Cassidy had chased Rosenqvist, but the Kiwi dropped back with a rough engine in the final laps, allowing Daniel Juncadella to complete a rise from 11th on the grid to seventh in his Hitech car. Dan Ticktum put in a superb performance in only his second F3 outing to lead experienced team-mate Alexander Sims in a Double R Racing eight-nine, while Carlin's Jake Hughes completed the top 10.